…and it’s pretty good. This is the first time in a long time that I’ve used a local email client instead of an online one, so I wasn’t completely sure what to expect. I’ve been using my school email as my primary email account, and the school is switching over from using Microsoft Outlook Web Access (OWA) to Gmail. The Gmail web interface is pretty good (in fact, many would say it’s one of the best), but what hangs me up is that there is no preview pane for reading messages. In Gmail, the only way to see what an email says is to open it, which takes more time and clicks. It’s harder to quickly go through and delete messages when you have to open each one. For a lot of people, this isn’t really a problem, but it got me looking at other ways to view my email. I wanted to try a local client, because it would allow me to backup my emails to my hard drive and view my messages when offline. I’ve actually been meaning to do this for a while, because there have been many times when I’ve needed to consult an email and there was no internet connectivity. (In such instances, I usually then turned to my iPhone). 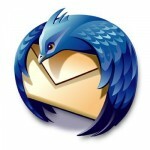 I decided to try Mozilla Thunderbird because 1) I’ve heard good things about it, 2) it’s open-source, and 3) it’s free. I downloaded Thunderbird 3 Beta 2, because while it’s a beta it promises faster and more aggressive downloading of messages using IMAP. I haven’t noticed any bugs or crashes yet, so I’m not regretting downloading the beta instead of the last major release. My first impression of Thunderbird is this – it’s fast. It was very quick to download emails and folders from the server, and practically everything I do in the program is instantaneous. Even downloading messages for offline viewing only took a few minutes. This is refreshing after OWA, which usually lagged a second or two for any given task. Setup of Thunderbird was a little tricky, but no worse than inputting IMAP settings on any other email program. I spent a good 20 minutes rummaging through the settings and making it work the way I like it. There is one item I’m a little confused about, but it may have less to do with Thunderbird and more to do with IMAP (with which I have fairly limited experience) – sometimes when I delete or file messages in Thunderbird, the changes are reflected in the web client, and sometimes they aren’t. I don’t know why that is, but ideally I want everything I do in Thunderbird to be mirrored in the web-client when I need to access my email online. The interface for Thunderbird is not terribly exciting, but it gets the job done. It’s kind of boring, but things are laid out logically. And, yes, there is a preview pane. Skins are available for previous versions of Thunderbird (and probably for Thunderbird 3 once it gets out of beta), but I wouldn’t want to decrease the speed of the application any or increase the RAM footprint of the program. The program has a lot of built-in shortcuts that I have yet to learn how to use. However, I already appreciate the built-in spell-check and junk-filters. Overall, I’m impressed with Thunderbird in the limited time I’ve been using it. It meets my relatively simple demands, and it meets them well. 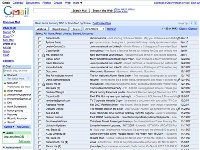 With the program, I can manage email efficiently and quickly. It’s hard to ask for more than that. I do need to figure out how to make IMAP work better for me, but I think that is outside Thunderbird’s purview.